Our wood veneer hobby packs come in a set variety of options with standard sizing. Designed to meet a variety of applications, our huge selection of wood veneer hobby packs can meet any need you may have. Here at Sauers & Company Veneers, we complement our extensive experience in the veneer industry with quality veneer hobby packs and committed, qualified staff to ensure that whatever your needs, they are met with exactness every time. 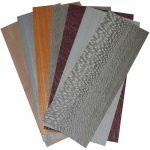 Our wood veneer hobby packs are available in exotic and domestic wood, and every pack features varying-length veneers. While we offer standard hobby packs, we also take custom orders, so whether you want hundreds of veneers for a bulk project or just a few custom pieces, we are here to meet your needs with exactness. We ship most orders 24 to 48 hours after placement, and our inventory of wood options is incredibly unique. Our wood veneer hobby packs come in a set variety of options with standard sizing. For example, offering a varying sheet count, we provide packages in four, six, and eight square feet. When you need wood veneer hobby packs, we are your top resource, especially since customer service is and always has been our main priority. Our business was founded on the principles of providing competitively priced, quality wood veneers, and we stick to these values today. We are ready and waiting to answer any questions you might have about our wood veneer hobby packs. Contact us at Sauers & Company Veneers today to speak with a member of our team about your options. At Sauers & Company Veneers, we create wood veneer hobby packs for residents of Anaheim, Los Angeles, and San Francisco, California; Dallas, Texas; New York City; Chicago, Illinois; Boston, Massachusetts; Charlotte, North Carolina; and anywhere else in the United States.